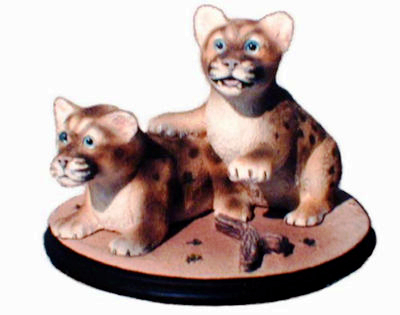 A pair of panther cubs train with a stick in the endless cycle of life. Exquisite realistic painting creates the patterns of soft fur. These playful wildlife cats would make a cheerful addition to your gift list. Available as the Florida Panther, Black panther, and mountain lion. Brand new art with artist signature, copyright and unique hang on card. The panther cubs baby blue eyes will turn yellow/gray at adulthood. Pumas are of the (genus felis) purring cats, including the domestic cat. These active kittens are learning much needed survival skills during play. The cougar kittens must stay with their mother for 18-22 weeks while they learn enough skills to survive on their own. The panther's survival depends on the survival of large, ecologically balanced parks and refuges, which provide lairs for these magnificent cats. Panther tracks are three inches in width: larger than the largest bobcat. ..More ART: ..